This week we worked on one to one correspondence, cardinality, number conservation, counting objects to 5, and recognizing the numbers 1-5. We also discussed how we can count left to right and right to left, how we can count up and down, and backward. 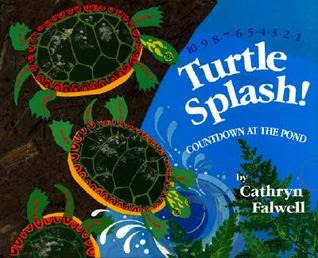 We used the book Turtle Splash! as a springboard for several number/counting activities. We used turtle counters and 10 frames from this unit from Deeanna Golden's Math Boards unit. We moved our turtle counters far apart and put them close together to learn about number conservation. By the end of the week and working on it everyday most of my students had a solid understanding of this concept. While the book goes up to 10 we focused on 1-5. We pretended to be turtles in a pond. We counted left to right and right to left. We counted backward. We also decomposed the number 5 using turtles in the pond and turtles on the log. We acted out all of the different combinations of 5. We used a variety of activities throughout the week to reinforce our learning. We formed the numbers 1-5 and created sets using Play-Doh. These mats came from Tara West's Math Centers Super Pack. I moved the pathway counting game to a work station tub. The other 5 tubs have manipulatives in them for now. Next week I am going to switch out one of the manipulative tubs with the Play Doh number cards and Play Doh. This pathway game came from Kim Adsit's Let's Take Turns unit. We also played several dice games. We rolled and graphed with dice and played this simple rolling and counting game from Kathleen at Growing Kinders. We watched and sang along with several fun counting videos and songs from Carolyn Kisloski's Math Common Core Prezi Bundle. I also used Carolyn's Prezi to find number games, anchor charts, and other counting/cardinality/base 10 activities. This bundle is aligned with the common core standards and also contains Prezi's for measurement and data, geometry, operations and algebraic thinking. The direct links in each Prezi makes getting to all of the resources so quick and easy. Thanks for sharing all these ideas! I have a strange question, where did you get the blue and green book bins in your library? I have been looking for something similar for my library. My buckets came from The Dollar Tree. Hi! I recently came across the math activities on your blog and love them! I was wondering if you do these types of activities as a whole group or with small groups? I teach math in both whole and small group. These activities are a mix. I never move an activity to a station or independent work until the students are have had extensive whole and small group instruction with it.